Fast, free and offline English to Hindi Dictionary app by SHABDKOSH.COM! 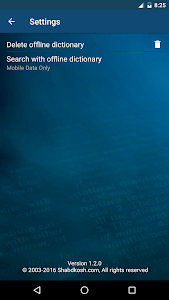 This English Hindi Dictionary app brings our trusted content and service to Android users. This English Hindi Dictionary has the most comprehensive Hindi and English vocabulary you will find in any English to Hindi Dictionary App on the Google Play store. This app has a user-friendly English Hindi Dictionary along with English definitions, quiz game, spoken English and Hindi audio pronunciations, synonyms and antonyms. 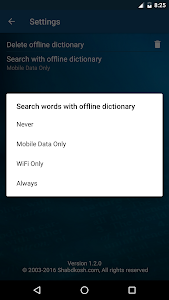 Best of all, you can download Shabdkosh Offline Dictionary in Settings screen and use this app without any data connection. 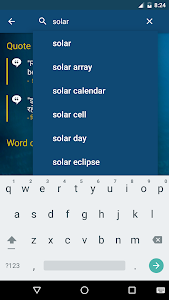 Start typing Hindi words using Hindi keyboard, or type Hindi words in English and have the SHABDKOSH app suggest you words even when you are not typing in Hindi! Tap any suggestion to get the English translation, meanings and spoken audio pronunciations. Tap the star icon to save the word for future reference. 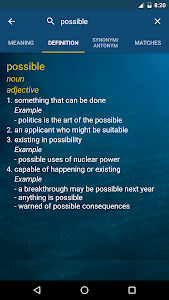 Type the English word and see immediate suggestions from the huge collection of words and get to the meaning quickly by tapping any suggested word in the list. The Shabdkosh dictionary app shows exact meanings, definitions and short examples along with translations, synonym, antonym and right grammar attributes. You can also choose to listen to the audio pronunciation or see the pronunciation in Hindi - another unique feature of this app! Any tap on the meanings will take you to the reverse lookup any of the meanings. This helps you in understanding more of each word shown by presenting this unique cross-search feature. 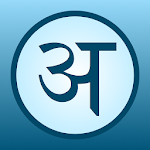 The Shabdkosh Offline Dictionary app has the best spoken audio pronunciation in a pleasant Indian voice - for both, English and Hindi. Just tap the speaker icon on any word or meaning to hear the spoken audio pronunciation with a very small amount of data usage. We have very high quality Word of the Day and Quote of the Day features to help learn something new everyday. The nifty Word Quiz Game Quiz in English and Hindi helps you pass time while learning something new! 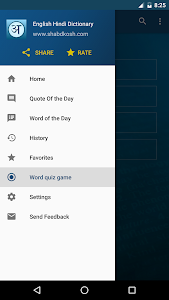 The users of Shabdkosh English Hindi Offline Dictionary App are very fond of this simple and quick games - which also works without using your data in offline mode. 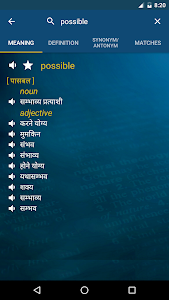 This Hindi to English dictionary is also available on mobile browsers at http://www.shabdkosh.com. We hope you will like it - and review it in the Google Play Store! Added option to share Quote of the Day. Fixed some issues seen in previous releases. Similar to "English Hindi Dictionary"